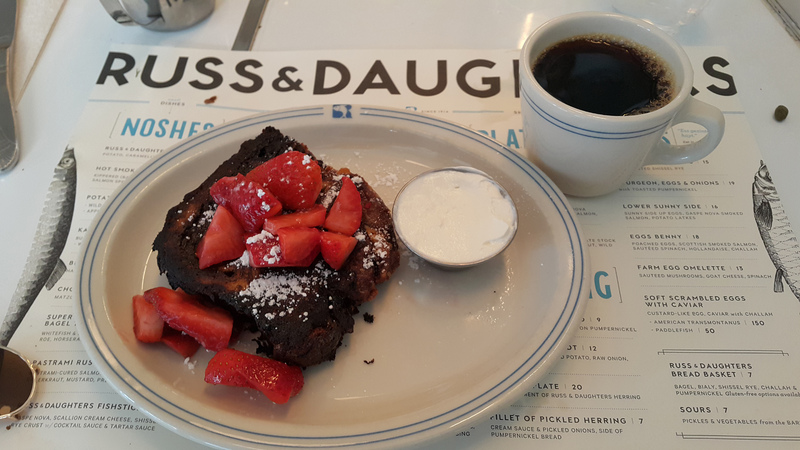 How could I have lived this long without the scrumptious culinary delights at Russ & Daughters Cafe? Well, it is partly because they opened just 14 months ago. But there is 101 years of tradition on sale at this shiny new eatery, located at 127 Orchard Street, a few doors above Delancey. The fourth-generation family enterprise has been in the business of “appetizing” since 1914. Their thriving sliver of a shop on Houston Street features smoked and kippered fish that temps from behind the left counter, while sweets are longed for from behind the right counter. It is one of the last holdouts from a time when the neighborhood was dotted with similar shops. But while the cafe offers traditional Jewish fare from indulgent delicacies like caviar to kibbutz comfort food like kugel, it is a thoroughly modern concern, with a hip, multicultural staff and clientele, reflecting the demographics of today’s Lower East Side, although the menu is focused very much on tradition, and quality. Even the coffee is excellent, if pricey at $3. There was none of the citrus sourness too often infecting boutique brews these days. It was nutty and robust, while the acidity was understated, so I had no inclination to add milk. But I did eventually, just to see. It actually took a good deal of milk to make a dent in such a deep, dark roast, but with the proper ratio it transformed into a luscious café con leche. Left black, it is full-bodied, with a taste akin to espresso, making it the perfect companion for my chocolatey desert. But I am getting way ahead of myself, as that was the jewel at the end of a satisfying meal. As a waspy Ohioan growing up a long way from the sea, I never liked fish of any sort. But I had always wanted to try matzo ball soup, after hearing about it in countless movies and TV shows. I have since become something of a connoisseur, so of course I had to order it, despite the 95 degree heat outdoors. Thankfully, the cafe’s AC is top notch, and it’s been ages since I tasted this centerpiece of Jewish bobeshi cooking. It was a great way to end my matzo fast. 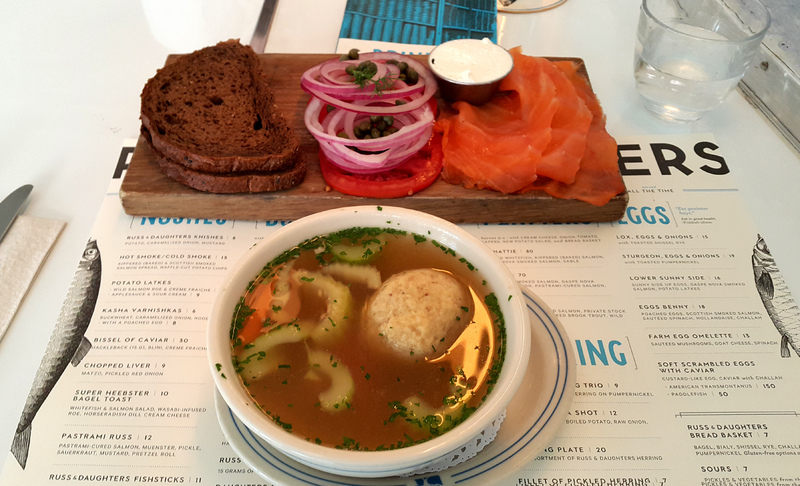 Traditional but not typical, R & D’s matzo ball soup ($8) is made with a dark and savory bone broth. Russet colored and flecked with herbs, with a smallish ball of dense matzo accompanied by buoyant arcs of celery and a rogue piece of carrot that lounged against the side of the bowl. It is incredibly salty! Stunning really. But my pallet adjusted quickly, and all that salt was balanced with the subtler flavors in the broth, accented by the tannic crunch of fresh celery. The menu listed chicken in the ingredients, but I didn’t see any. And then I realized it was in the matzo ball. That is a nice touch, as it imbues much more personality than found in the usual bland wad of pithy dough. Each bite provided a schmaltzy satisfaction, enhanced by the occasional little morsel of dark chicken meat. And the matzo ball was not salty, so it proved a toothsome counterweight for the broth, which took on more chickeny taste as the ball was sliced up. I only kept from drinking the last ounces because of all I had yet to ingest. While I still avoid the fishiest of fishes, decades of living in a deep water port have expanded my tastes, so I followed the soup with “the Classic” smoked salmon plate ($16) and was enraptured. This fish is delish, and oh so rich. Silky yet firm, thin yet massive and melting with tenderness. It was lightly smoky – think Oban rather than Laphroaig, both of which are available by the glass at market prices for diners who like to pair smoked fish with smoked single malt whisky. Being late in the day and intent on desert, I had my lox with pumpernickel bread, rather than one of their bagels (which are sourced from the Bagel Hole right here in Park Slope.) And I indulged in the tangy pleasures of the salmon, alone or as a tier in a stack of onion, tomato, capers, and cream cheese. The menu refers to this fish as gaspe nova smoked salmon. Once upon a time that would have meant wild salmon from the Gaspé Peninsula of Quebec that was prepared like traditional Nova Scotian “lox.” Today it means high-quality farmed salmon from Norway (where my favorite sashimi comes from,) which is smoked in Brooklyn, to approximate the gaspe nova lox experience. And it was terrific! The same can be said about the quality of everything that passed my lips. The July tomato was meaty and tasted like it came straight from a garden, or at least the farmers market. So good, I ate most of it by itself. The onion was crisp and kindly, and every bit as fresh as the tomato; the cream cheese earned its qualifier, and the capers were plump and popping with flavor. My only complaint is that the smidgen of dill wasn’t nearly enough for the ample supply of fish. But I do know it has gone missing from local bodegas, so perhaps they are trying to stretch their current supply. Also, the bread was so mild it was basically a delivery platform. 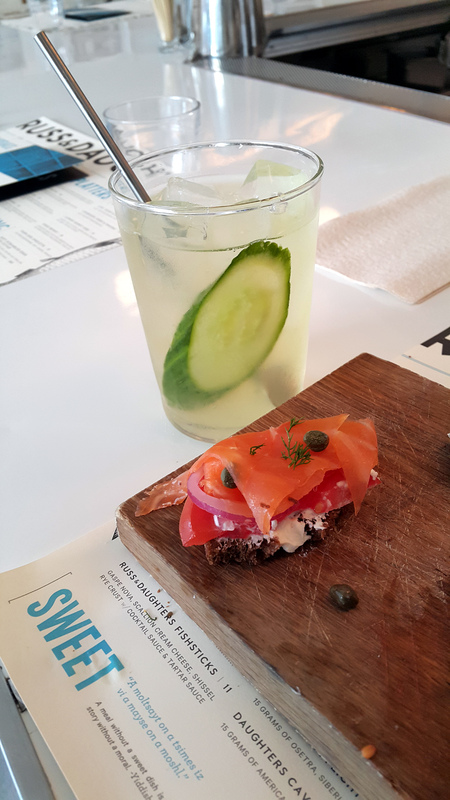 Next time I will try their old-fashioned shissel rye, as this salmon should stand up to it nicely. Although they have a well-stocked supply of spirits and wines, I had one of their soft drinks, concocted at the soda fountain from seltzer and various flavored syrups. I enjoyed the cucumber soda ($5.) It was a good choice for the meal, softly flavored with essence of jasmine, fennel, dill, anise and lime, and garnished with a long slice of fresh cucumber, which when eaten was an ideal palate cleanser between the lox and the “babka french toast,” ($10) full of gooey chocolate spread, and served with fresh strawberries and sour cream. Even with the very adult coffee, the babka was almost too much for one person – almost. But I did get a good look and whiff of the fruit compote blintzes, and I am definitely having them next time, after a knish or perhaps some latkes, and another smoked fish plate. I have always wanted to see what sturgeon tastes like. Yes, one pays some premium to sit down to delicacies that can be had at the Houston street shop for less. But many things well worth having are available only at the cafe. And the AC is awfully nice, even though the seats at the counter seem made for one sprier and smaller than I. But otherwise, the environment is quite enjoyable, as is the cheerful, young wait staff, for their fashions and body art if nothing else. I just happened to pick up some rugelach at the shop to take with me to Martinfest in a couple of days, and I was feeling a bit peckish. So I thought I would finally check out Russ & Daughter’s cafe, to see what it was like. I am glad I did, even if I am also glad it is not closer to home or near my usual thoroughfares. Otherwise, it could be far too habit-forming.